NEW YORK (AP) — After a season marred by narrow defeats, Jacob deGrom became a runaway winner. The New York Mets ace easily won the National League Cy Young Award on Wednesday night, a reward for a historically fruitless season in Flushing. The right-hander had just 10 victories, the fewest ever by a Cy Young-winning starter. 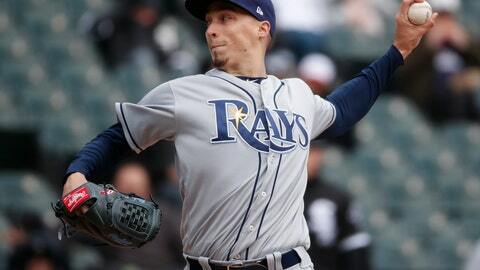 The AL prize also reflected a change in voters’ values, with Blake Snell of the Tampa Bay Rays narrowly beating out past winners Justin Verlander and Corey Kluber for his first Cy Young. Snell pitched just 180 2/3 innings, fewest ever by a Cy Young-winning starter. Over full seasons, Snell is the second starter to win the award with fewer than 200 innings after Clayton Kershaw logged 198 1/3 in 2014. “I definitely think the game has changed in that aspect,” deGrom said. DeGrom easily beat out Washington’s Max Scherzer, who was seeking a third straight Cy Young and fourth overall. DeGrom got 29 first-place votes and 207 points from members of the Baseball Writers’ Association of America. Scherzer had the other first-place vote. In his first season after chopping off his distinctive long hair, deGrom cut down hitters from start to finish despite little help from teammates. He had a 1.70 ERA, the lowest in the NL since Zack Greinke’s 1.66 mark in 2015. Yet the 30-year-old right-hander went 10-9, eclipsing the low bar among starters of 13 victories set by the Dodgers’ Fernando Valenzuela in 1981 and matched by Seattle’s Felix Hernandez in 2010. DeGrom allowed three runs or fewer in 29 consecutive starts to close the season, breaking Leslie “King” Cole’s 108-year-old record of 26 such outings. Yet the Mets were 11-18 in those games and 14-18 overall with deGrom on the mound. “My thought process was, ‘Hey, take the ball every fifth day and continue to try to put this team in position to win and control what you can control,'” deGrom said. Hernandez’s Cy Young victory signaled a major shift from voters, who once prioritized pitcher wins. The push toward advanced analytics made deGrom’s candidacy possible, and by September there was little debate deGrom was worthy, even as the Mets regularly wasted his dominance. Perhaps no pitcher had ever been such a hard-luck loser. New York averaged 3.5 runs in games started by deGrom, second only to Cole Hamels for worst support in the majors among qualified pitchers. During one stretch late in the season, the Mets totaled 10 runs over seven of deGrom’s outings, and four of those were driven in by the pitcher himself. DeGrom nearly produced more wins above replacement than actual wins — an unfortunate sabermetric feat that has only been accomplished once, when the Philadelphia Athletics’ Eddie Smith went 4-17 with 4.1 WAR in 1937. Baseball-Reference calculated deGrom for 9.6 WAR. The 2014 NL Rookie of the Year, he became the seventh rookie winner voted a Cy Young, joining fellow Mets Tom Seaver and Dwight Gooden. R.A. Dickey was the only other Met to win a Cy Young. The Mets unveiled a deGrom bobblehead featuring the Cy Young Award shortly after deGrom was crowned. They will give away 25,000 prior to a home game April 7 against Scherzer’s Nationals. Snell got 17 first-place votes and 169 points to 13 first-place votes and 154 points for Verlander. Kluber had 71 points, followed by Boston’s Chris Sale and Houston’s Gerrit Cole. Snell had a 1.89 ERA, third best in the AL since the DH was introduced, trailing only Ron Guidry (1.74) in 1978 and Pedro Martinez (1.74) in 2000. The 25-year-old pitched had 33 1/3 fewer innings than Verlander, but his dominance was enough to sway the electorate. The lefty nicknamed Snellzilla wreaked havoc against the AL’s top lineups. He was 3-0 with a 1.08 ERA in four starts against the World Series champion Red Sox, and 2-0 in two starts each against the Astros and Indians. The Yankees roughed Snell up twice, but he got threw five scoreless innings in a victory Aug. 16. That came during a late-season run of nine consecutive wins for Snell, including a victory against every team in the AL East. He also made five starts against former Cy Young winners and went 3-0 with an 0.59 ERA. Snell was the first player 25-or-younger to win 21 games since Barry Zito in 2002. He was highly regarded as a minor leaguer for his electric arsenal, but subpar control led to struggles during his first two major league seasons. He was even demoted to Triple-A for a month in 2017. It all came together this year. Snell was a stalwart for a most unusual pitching staff, taking the ball every fifth day while manager Kevin Cash successfully experimented with reliever “openers” to start games in between. Snell led the Rays with 31 starts, and no other traditional starter had more than 17. After longtime franchise ace Chris Archer was traded to the Pirates on July 31, Snell went 9-0 with a 1.17 ERA. “I felt with the opener, I had a bigger role on the team,” Snell said. Snell is the second Rays pitcher to win the award, following David Price in 2012. Scherzer went 18-7 with a 2.53 ERA and led the majors with 220 2/3 innings and 300 strikeouts. He was attempting to become the first player since Randy Johnson to win three consecutive Cy Youngs. He got the first-place vote of John Maffei of the San Diego Union-Tribune, 29 seconds and 123 points. Aaron Nola of the Philadelphia Phillies was third with 86 points, followed by Colorado’s Kyle Freeland and Arizona’s Patrick Corbin. Verlander led the AL with 290 strikeouts while going 16-9 with a 2.52 ERA for AL West champion Houston. This is his third second-place finish since winning the Cy Young and MVP in 2011 with Detroit.